From medical devices to cars to smart power grids, the products in our everyday lives are more intelligent, instrumented and interconnected than ever. And combined with the Internet of Things, the complexity associated with developing these products is also on the rise. 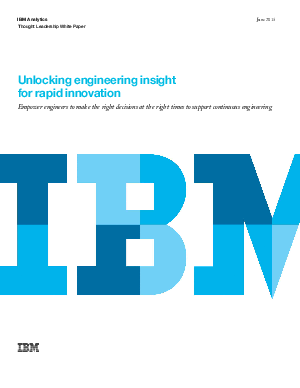 By unlocking engineering insight with IBM solutions, organizations can deliver fast, easy access to engineering information - across multiple disciplines - so engineers can make the right decisions at the right time to speed development, improve quality and advance innovation. Learn more in this IBM white paper.